Jennifer Brule is on a mission, southern style, to teach people to cook. 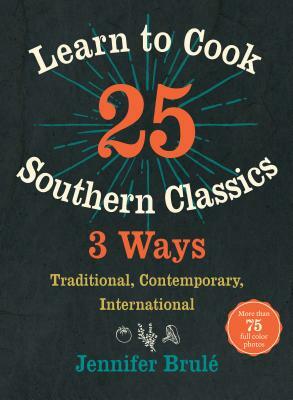 Her method: master twenty-five classic southern dishes, and then--using similar ingredients or cooking techniques or both--make two variations, one contemporary and one inspired by international tastes. Brule's line-up of beloved southern dishes is irresistible in itself, but she aims to inspire enthusiasm and confidence to expand deliciously from there. The beauty of her approach is that it reflects how people really do learn to cook, resourcefully, creatively, and joyfully. Savor the Classic Chicken and Dumplings and next find yourself cooking Vegetarian Mushroom Stew with Sweet Potato Dumplings before whipping up Hungarian Chicken Paprikash with Dumplings. Featuring step-by-step instructions designed to teach basic cooking techniques, Brule shows cooks how to whisk, chop, slice, simmer, saute, fry, bake, and roast their way to seventy-five wonderfully tasty dishes. The contemporary versions incorporate especially wholesome elements, such as unrefined grains and healthier fats, while the international versions offer popular global tastes. Color photographs of each dish illustrate the wide array of meats and fish, vegetables, side dishes, and desserts that can soon be on your table.